Scava is holding a romantic exhibition at the Sayers Art Gallery during February. GEORGE ENTERTAINMENT NEWS - The Sayers Art Gallery at the George Museum is hosting a Romantic Valentine art exhibition for the month of February. Scava (South Cape Association for Visual Arts) is calling all artist members to submit suitable artworks for this unusual event. 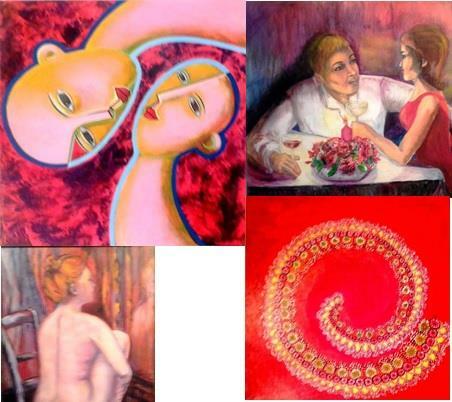 Art can cover all romantic subjects - flowers, wine, books, poetry, chocolates, male and female portraits, and everything that contains the colour red. Artworks with a romantic feeling are also on show. These include landscapes and seascapes with marvellous colour bursts of sunsets. The exhibition organisers aimed at projecting life, love and happiness. The exhibition is already open to the public daily (except Sundays) until 28 February. The gala celebration will be on Valentine's night, 14 February. All artists, their families and friends, art lovers and art investors are invited to join and celebrate in the relaxed happy surroundings of the Sayers Art Gallery, sipping sangria and discussing art and culture. RSVP Maura St.John on 083 485 4177.